Today I felt fiery, so I decided to do flame nails... plus I bought OPI for Sephora's What's a Tire Jack? Matte, so I had to try it out! The flames on black matte reminds me of classic hot rods, love it. I used OPI Banana Bandana as a base, then used the water marbling technique with Zoya Pippa, China Glaze Salsa, and Urban Vibe nail polish in Orange, which I got for 50¢ at Wet Seal. 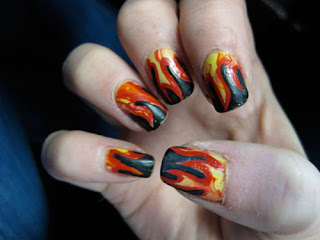 After the water marbling dried, I painted on the red flame outlines with China Glaze Salsa, and the filled in background of the flames with OPI for Sephora What's a Tire Jack? Matte, which is a VERY nice true black matte. OMG I love flames! Can you come over and paint my nails...please! OK, those are pretty damn cool. If you looked like Bettie Page and had nails like that it would make me walk funny. This is my first time to your blog. I love it I HAVE to do this, but I am AWFUL at water marbling. New follower! Danica- thanks! Water marbling is VERY frustrating sometimes, but keep trying, and make sure you send a picture- I want to see your recreation!! Love the hot rod manicure. Great job. It looks cool, but at least this one on the photo, it doesn't look like a great job, it seems to have a lot of bumpiness in the nail. 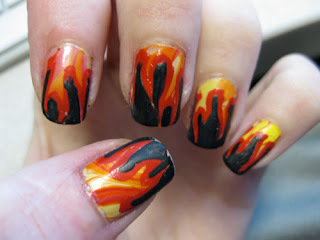 wow.. cool.. your nails look just like a chopper with cool flames design.. nice..